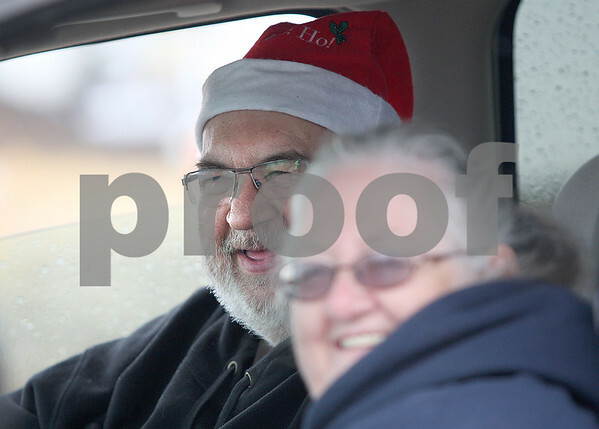 Wayne Cline smiles with his wife Peggy Cline (right) while they sit in their car with son Brian Cline (not pictured) watching the volunteer group One Family One Purpose from LaHarp, Illinois, work on their home in Fairdale on Monday, Nov. 30, 2015. Wayne, 62, was born and raised in the home on West St. in Fairdale. He, his wife, son, and a rooster, survived the April 9 tornado and first responders found them in the wreckage.